PokerTH Game Review - Download and Play Free Version! PokerTH Delivers a Sophisticated, Authentic and FREE Texas Hold 'em Experience! Can be played by yourself or with other people. Boasts a large and very active online community. Very easy to set up a game with your own preferred settings. Includes spectator mode and online leader boards. The AI opponents don't seem very smart. PokerTH is a virtual card game that delivers an authentic Texas Hold 'em experience. It is also open source and cross platform, and its thriving community ensures consistent evolution and timely updates. PokerTH uses an attractive yet minimalist card set and interface that favor functionality and performance over style. However, if the player prefers something more elaborate, they can customize their experience with the dozens of freely available decks and tabletops. 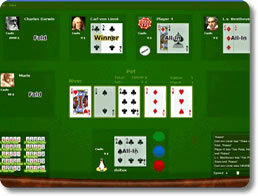 PokerTH is an extremely versatile Texas Hold 'em game. Players can play locally, with one or ten players on a single machine, or they can play via LAN or Internet. PokerTH even has dedicated servers for the Internet games. The PokerTH website also has leaderboards and tournament data, which delivers that online cardroom experience but without the hassle and big costs. Players can also set up the same functionality for the LAN games, which is a perfect tool for poker clubs. What truly distinguishes PokerTH from those other Texas Hold 'em platforms is its sophisticated AI engine. The engine powers up to ten distinct computers opponents, so you can run a pure simulation or play a solitaire version. These AI opponents actually play the game: they raise, fold and even bluff. Development of the AI is an ongoing and regular process, and the community is actively involved in improving the AI by exposing weaknesses and irregular behavior. In the past, our solitaire card experiences have been limited to the likes of FreeCell, Solitaire and Hearts. There has never been a real alternative for the poker player, and available options have been diluted experiences that were much unlike the real deal. PokerTH, however, delivers you the most popular poker variant around in its truest form. 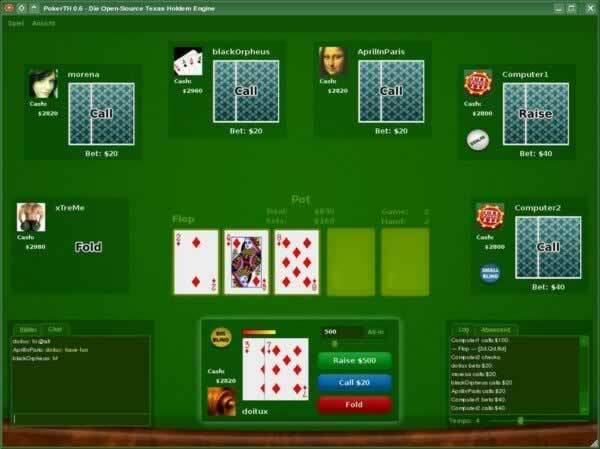 It even supports common Texas Hold 'em variations, and the AI opponents manage those variations just as well as they do the standard game. If you’ve been in search of a new poker game or any card game at all, you’ve found it. You don’t have to take anyone’s word for it either. Download PokerTH and try it for yourself. It’s completely free, so there’s no risk or obligation in doing so. Play locally, play online and even use the custom card sets and tabletops to tweak it until it’s just perfect for your play style. Then, join the online ranks, and begin your journey to the tops of the PokerTH rankings. PokerTH is a computer game that poker enthusiasts all over the world should recognize. Any that don't need to seriously get started. As an open-source game, it's been in constant development ever since it was first released in 2006. It's seen many improvements since then and has become one of the best digital poker games you can afford to play. The most amazing thing of all is that it's completely free! How is PokerTH capable of pulling this off? Read and find out. PokerTH is nothing less than an extensive Texas hold'em sim. You can play by yourself against multiple computer opponents, or go online and compete against human players all around the world. All the standard rules of classic Texas hold'em apply, but you're also given a myriad of options to fine-tune the game to your exact preferences wherever available. What kinds of options are there? Upon starting a game, you can set the amount of money all players begin with. You also determine how many players there can be in total. PokerTH supports something as small as two players competing against each other, but also has room for as many as ten people. Besides that, you have the option of changing the game's blind settings. You can choose how many hands and how many minutes need to pass before blinds can be raised. You can also decide how high blinds can be raised and in whatever specific order you like. It's pretty intense, but the program has the decency to let you save your blind settings yourself, so there's no need to fiddle around with them every time you open it up. If you can't or don't want to play with other people for whatever reason, PokerTH includes a singleplayer mode. You can put together a game real quick against up to nine opponents with all of the previously-described settings at your control. As for how it plays, it's decent for what it is. Unfortunately, not only is the computer lacking in personality, which is a vital part to the poker experience, it's not very intelligent either. Computer opponents will seldom, if ever, attempt to bluff you, and they're very easy to fool by you in turn. Overall, it's a pretty brainless affair. It's nice that PokerTH gives you the option of experiencing a singleplayer game, but it does need some work. Thankfully, the real meat of PokerTH rests within the multiplayer component. The tools are many and they're extensive. While the game may ask you to make an account, you don't have to if you don't want to; you can opt to just sign in as a guest. You'll find plenty of servers up and running, and more players online that are ready to put their bets down. Playing Texas hold'em with other people is a lot of fun. You have to be ready for anything, especially when you take both the available options and the potential number of players you'll be facing into account. Betting rounds are especially tense; you just never know when an opponent is betting high because he's got a good hand, or if he's trying to fool you and everyone else at the table. It doesn't have everything that a physical game of poker comes with, but the opportunity to play with so many people at once at any point in time for no money down makes the experience more than worth it! If the rules that other people set just isn't doing it for you, then you're given ample opportunity to set your own. Hosting a server is incredibly easy. All you need to do is press a button, set your preferences, and you're ready to go. You can even password-protect your server if you want to be selective in who can play your games. While PokerTH has all the fundamentals down, it also includes a platter of other features that only add to the fun. If you decide to make an account, then your profile will automatically accrue all matter of statistics that show off your performance and ranking in the PokerTH community. You're also completely free to check out other players' stats any time to get a feel for how good they are with the cards. PokerTH also has an extensive leader board that posts the names of the top 50 players. If you want to work towards something, getting your name up there can be an ambitious goal. One last feature is the ability to become a spectator. While this is something that's usually reserved for more action-packed multiplayer games like first-person shooters, it's an interesting change of pace to simply observe a game in progress. You can get a feel for other players' strategies and maybe share a private joke with yourself when you see somebody suffer a humiliating loss. Sadly, it can be kind of buggy and unstable at times. That's only natural as it's still new and in development. With luck, it should get better over time. There really is not much else to say. PokerTH has everything a Texas hold'em player could ever want. You can play poker against the computer. You can play poker against a whole crowd of people. 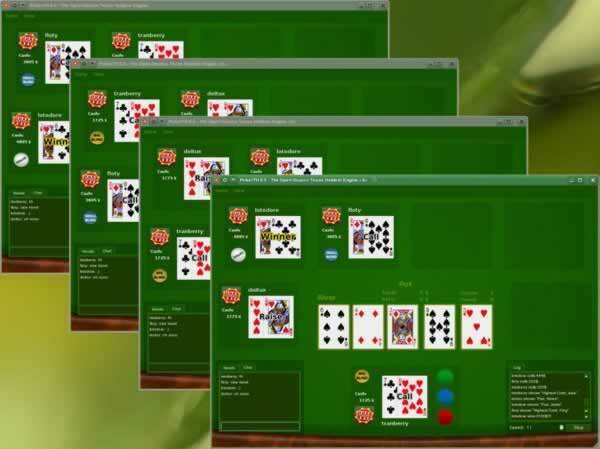 You can play poker anytime and anywhere on a wide variety of machines; it's available on Windows, Mac OSX and Linux systems. On top of that, there's even an Android version in the works. Most of all, it costs absolutely nothing to play. PokerTH is no free to play game with an alternative business model. It's an open source freeware game that's constantly being tweaked, updated and improved. If you love Texas hold'em, there is honestly no reason why you shouldn't play PokerTH. There's nothing to lose. Download it right now, start forming a hand, and join the growing community!